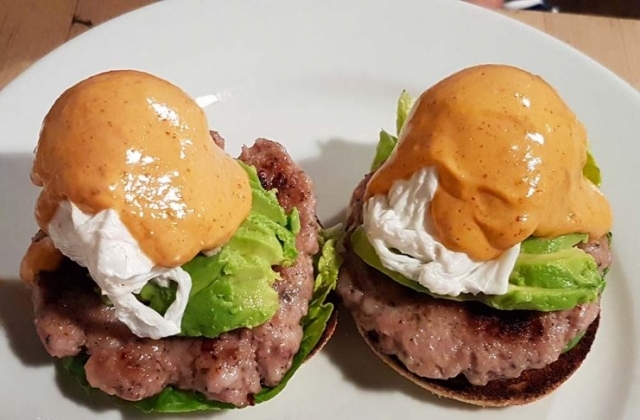 At the Refectory Kitchen in Canterbury, you’ll find a menu that not only offers the traditional breakfast fare we all know and love – Eggs Benedict, and Bacon ‘Sarnies’ – but also a fabulous selection of more eclectic breakfast delights to whet your appetite! 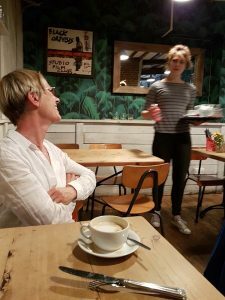 It was our second visit for breakfast (and will by no means be our last) to this wonderful family-run Canterbury bistro/restaurant with a lovely laid-back and friendly vibe. Greeted with a smile and welcoming hello, we find our way to our (now) favourite table in the corner, just in front of the open fireplace which divides the dining area. 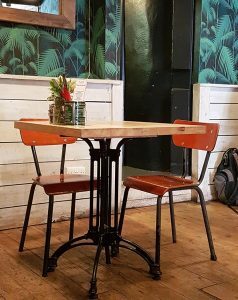 The location is small but roomy enough not to be cramped, with rustic wooden tables simply set-up with condiments and recycled food containers holding napkin-wrapped cutlery, and of course a copy of the varied menu. They also have street seating for those rare (British) warm sunny days! As you’d expect in this historic city, there is much character here, with beautiful beamed ceilings, walls adorned with an array of artwork, and an atmosphere that is only enhanced by the sounds of the likes of Bob Dylan, The Clash, and others, that serenade us while enjoying the culinary delights at ‘the refectory’. 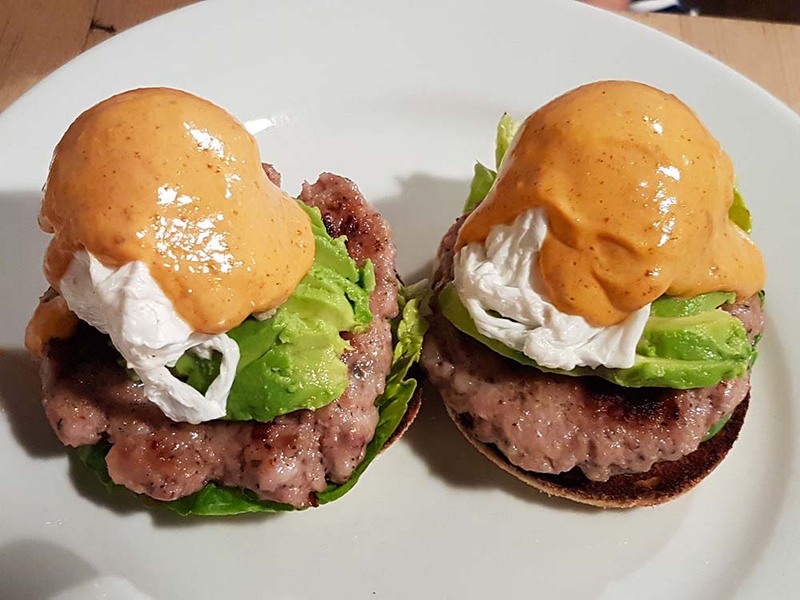 What’s on the Breakfast Menu at the Refectory Kitchen? So, down to business – what to order. 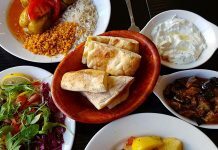 You’ll be spoilt for choice and will definitely have to return again and again to make sure you sample all the great flavours included on this menu. Today I chose the Ham Hock Hash and was not disappointed. A delight to the eyes as it arrived at the table, and to my tastebuds as it made its journey across them! 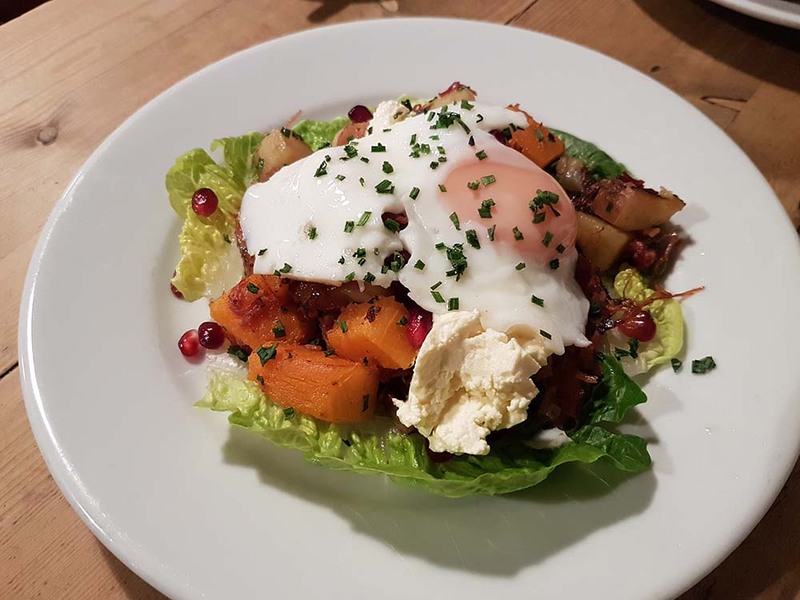 A perfect runny poached egg topped chunks of ham hock, potato and butternut squash hash, accompanied by sour cream and pomegranate. The combination of the soft potatoes, crunchy pomegranate and full flavour from the Ham hock was exquisite. A must for anyone who enjoy a healthy but tasty breakfast! 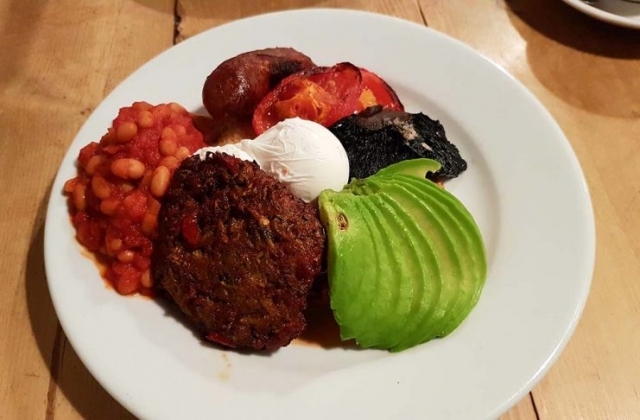 My partner decided upon The Refectory Veggie Up, adding a juicy locally sourced sausage (from one of our favourite food suppliers in Kent, The Goods Shed). 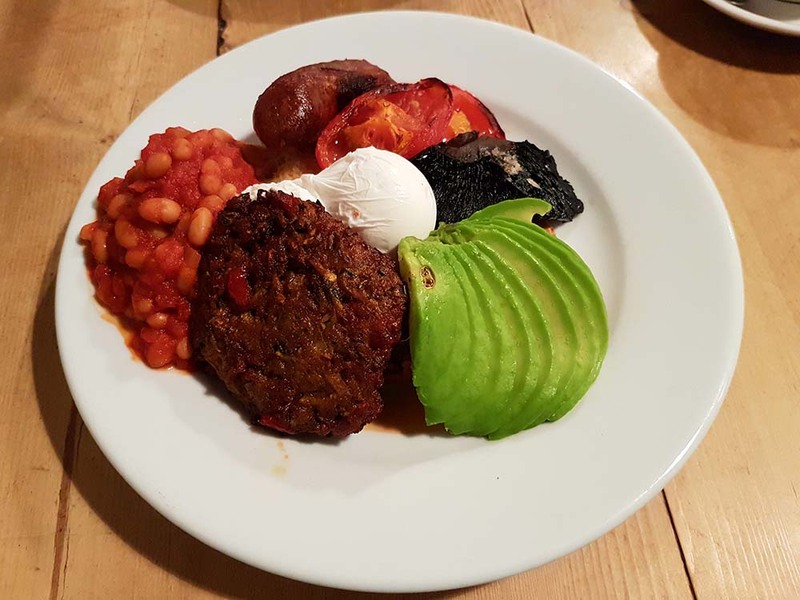 No disappointment here either – a colourful plate that made the mouth water simply by looking at it – thick cut granary toast topped with a vegetarian fritter (delicious, light and a the perfect accompaniment to the egg), fresh sliced avocado, grilled tomato, juicy Portobello mushroom, fabulous homemade baked beans, all adorned with a runny, yummy poached egg – and the much enjoyed juicy sausage! 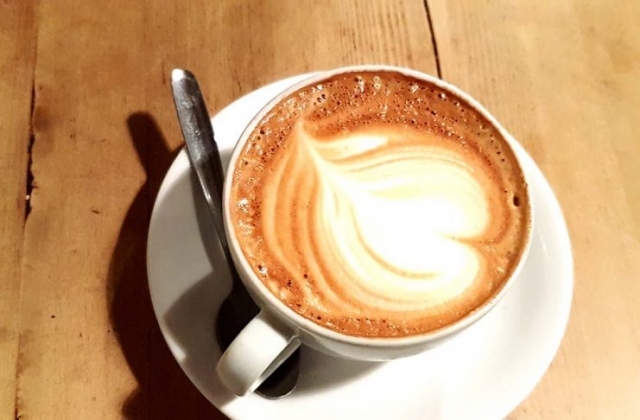 The coffee here too is quite an art-form )and passes the test of my partner who considers himself an aficionado of everything caffeine), with the staff adding artistic ‘latte art’ to your Cappuccino, Latte, Flat white or other coffee of your choice. Another thing I love about this place is that they are keen for feedback. On our first visit they’d recently added a new item to the menu – the Rectory Rancher, and since I ordered it they were interested to hear my thoughts… I loved it of course, and made sure they knew it! We won’t say it’s cheap here but it’s so worth every penny. A thoroughly enjoyable experience from every angle – food, service, location and price – all A1! What’s obvious here, and so rare in this day and age, is that the staff clearly love working at this cool little Canterbury eatery. In fact, our waitress Jemima shared with us that she is really proud to be part of the team, stating that the whole family are involved. There’s Dan, he’s the owner who works out front, his brother – he works out back in the kitchen, and of course Mum, she bakes the cakes. I tell you, it makes you feel all ‘warm and fuzzy’. So, we say, well done you guys. We’ll be back again soon. 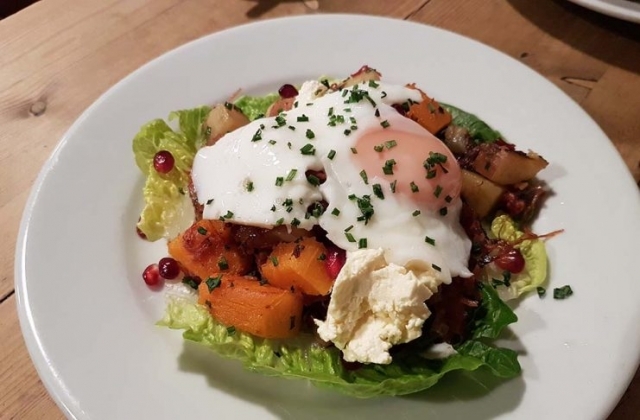 And the next time you find yourself in Canterbury and feeling a little famished, we suggest you head down to St. Dunstan’s Street and indulge the senses in something tasty and delicious at the Refectory Kitchen! 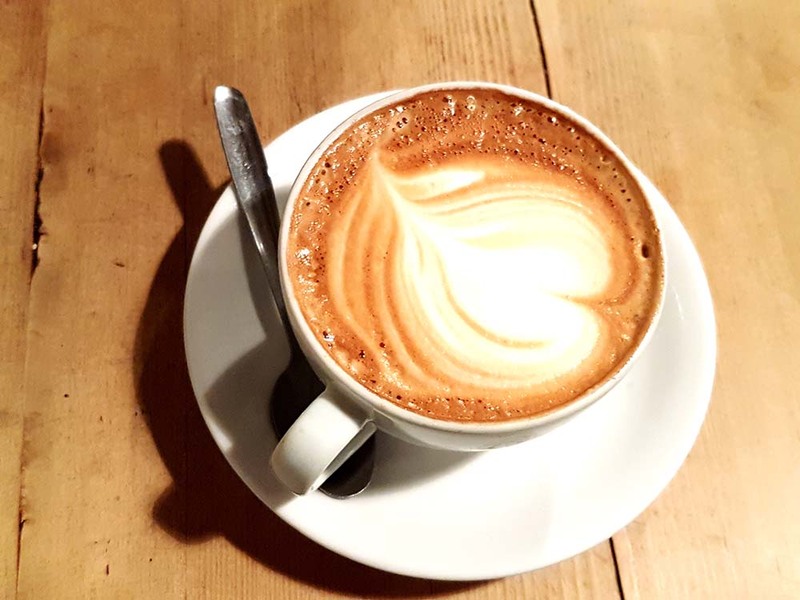 The Refectory in Canterbury is a rustic gem that serves a delicious breakfast with a wicked coffee.